Woodstock is a small New England town with so much charm, once named “the prettiest small town in America.” An afternoon stroll through the village’s green and the many main street shops are among our top recommendations on fair weather days. Lunch in Woodstock, however, is something for which we like to call on Mon Vert Cafe in particular. 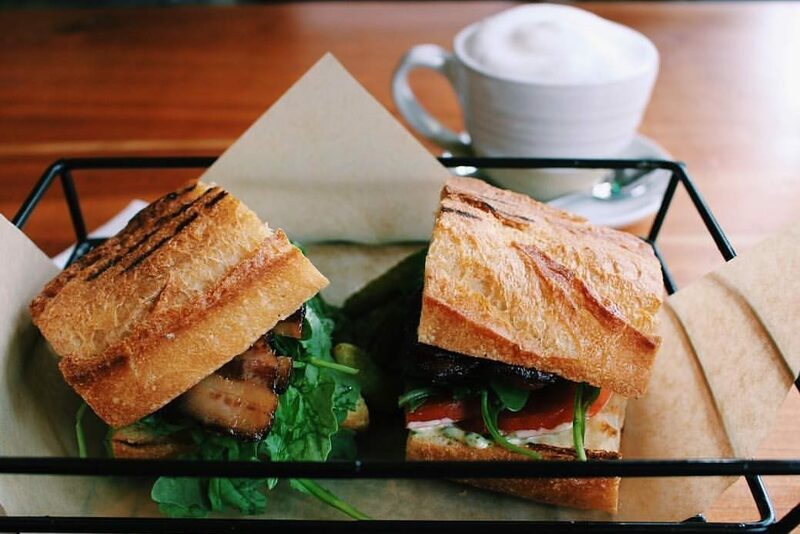 Newly relocated and focused on local fare, we love to visit their space nestled right on downtown’s Central Street. 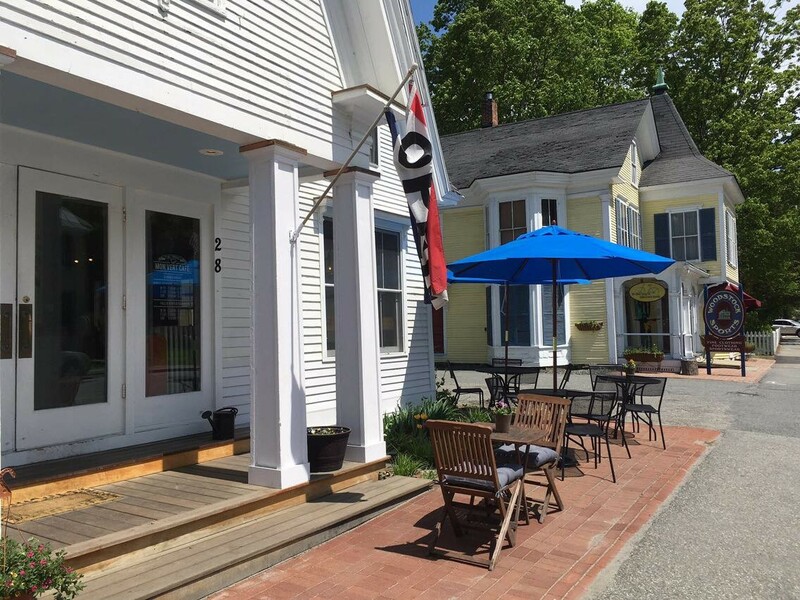 The cafe itself began about six years ago, after which Sam DiNatale and her mother, Sandy, took it over in January 2015. This duo has worked to build the cafe into a place for communal gathering, healthy food, and (arguably most important) good coffee! Sam grew up in Woodstock. After moving away and having her son, Sam returned to Vermont to give her child the same New England upbringing she enjoyed. Sam began working in the bakery department at the Woodstock Farmers’ Market. “I baked at home and really enjoyed it,” she says. 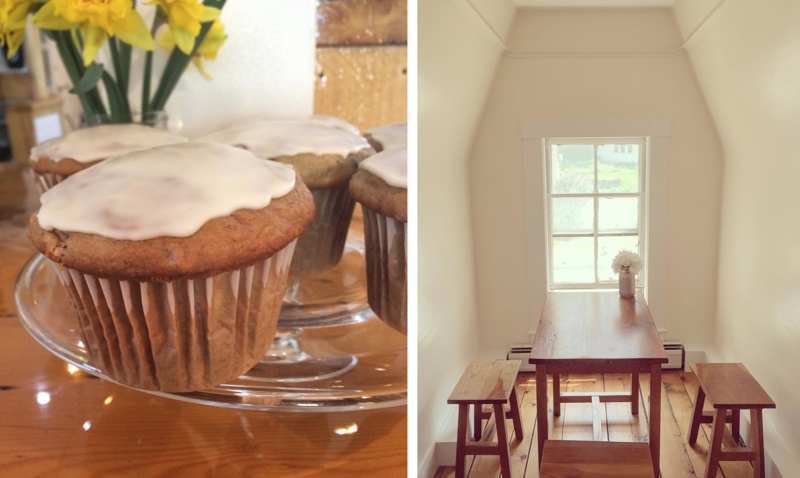 “At the market, I started as an entry level cookie scooper and after a few years, had the opportunity to step in as head baker.” As a way of expanding her culinary knowledge base a bit more, Sam also took on the role of pastry chef at Worthy Kitchen. Now she has baking implicitly woven into her own business. “It’s been an incredible learning curve. I really enjoy it and continue to find new ideas,” Sam mentions. “This town is my home, and its people are my extended family.” As such, Sam and Sandy aim to create a place where residents, as well as visitors, can enjoy themselves! 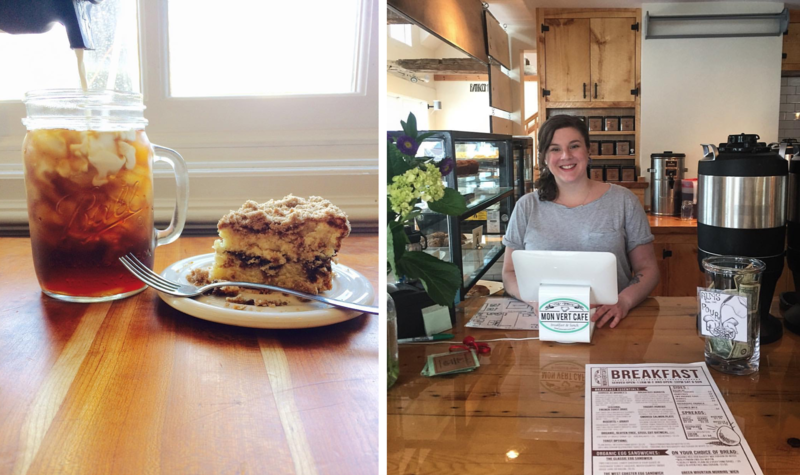 Their recent move down the street to a larger space allowed Mon Vert Cafe to grow and meet their customer demand – not a bad problem to have! Food is a main contributor to the act of gathering, and this is not lost on Sam. “My father once owned a coffee shop. Growing up in my household, anything less than flavors of chicken cacciatore or linguini with white clam sauce was a rarity.” Basic food doesn’t seem to be in Sam’s vocabulary. She grew up to truly appreciate good food and, in turn, takes pride in the food she serves others. The fact that she can share the food she loves with a community she admires is the cherry on top of the successful business. Vermont has a very large impact on Mon Vert Cafe. 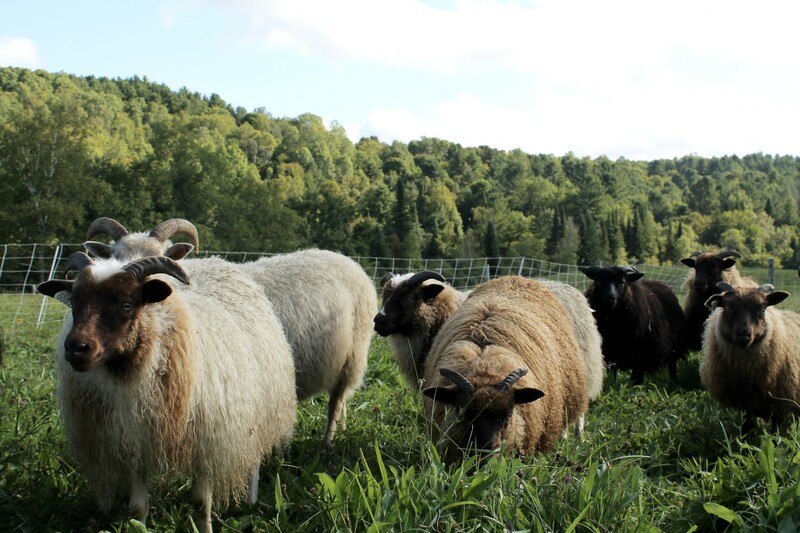 Sam notes, “With all the amazing products and farms around here, Vermont makes it easy!” Offering local food isn’t difficult because it is so abundant in these parts. 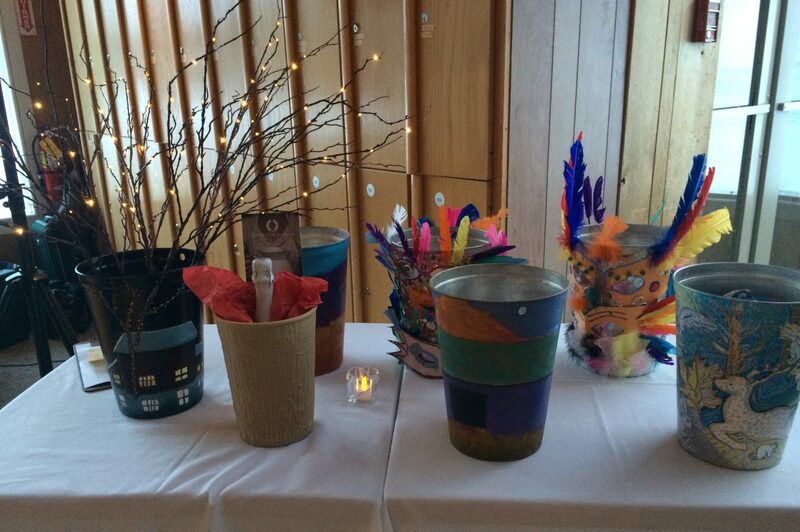 “The food industry in Vermont is an awesome group of people. 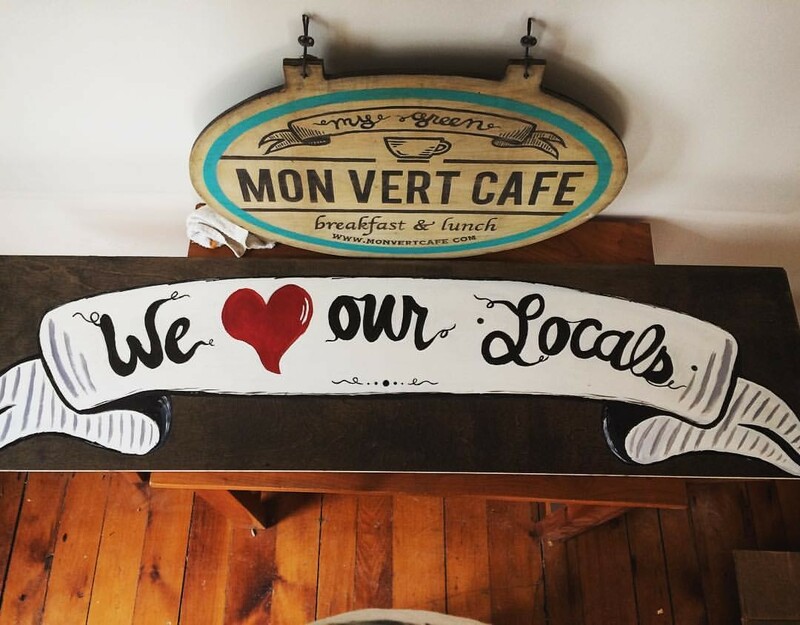 They love food, high quality food.” The cafe proudly dons a list of local producers used in Mon Vert on a daily basis. 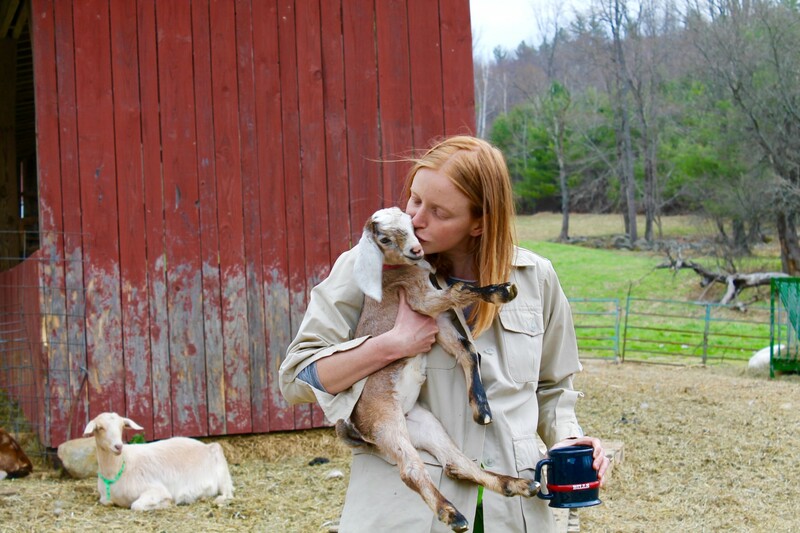 More than simply supplying, Vermont producers also have this way of building a relationship with customers like Sam. Jesse and Sarit of Plymouth Cheese, for example, will come and deliver their cheeses in person. They will take their time to chat and maybe even eat lunch at Mon Vert. The cafe also supports local makers! Just check out their Farmhouse Pottery serveware that came from right down the road. This is the beauty of Vermont’s food and community-based culture … there are so many deep connections to be had here. Sam looks forward to learning more about offering to this community. With a baking backbone well-secured at Mon Vert Cafe, she’d like to delve deep into the coffee aspect of her business. Sam plans to learn more about the detailed roasting process that goes into artisan brews. Mon Vert currently offers Vermont Coffee Company for their coffees (found here at The Jackson House Inn as well! ), which makes for a true and classic customer favorite. Mon Vert Cafe may also be expanding their cold-brew options in the near future! 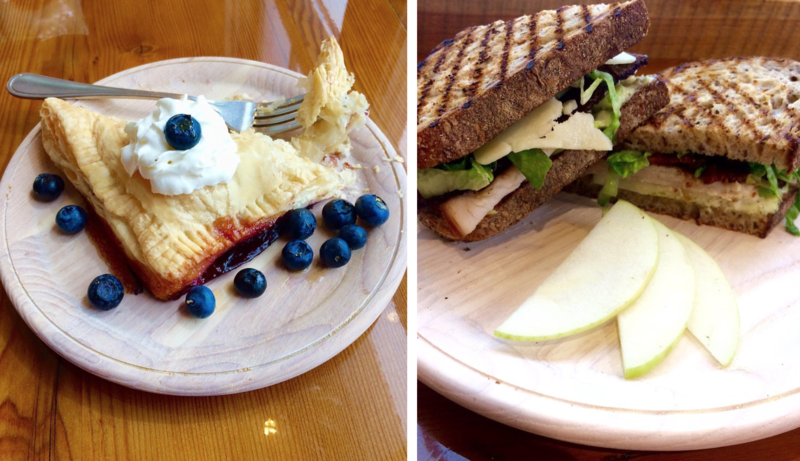 Mon Vert Cafe is the ideal place to sit, relax, and enjoy some lunch or breakfast. In fact, Mon Vert now has outdoor seating! On warm summer days, we can’t imagine a better situation. Sam is working on some patio seating to place behind the cafe as well! Ahhh there is nothing quite like sipping on coffee with a view of the Ottauquechee River. We are really looking forward to this addition! What are you waiting for? Head on down to the Woodstock Village and get a taste of our local fare.